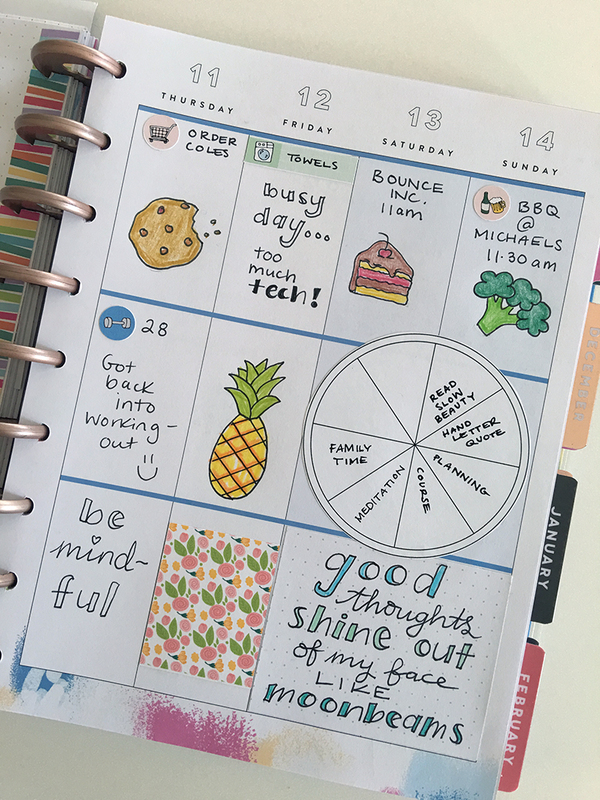 My Happy Planner weekly layout is a creative space for drawings, stickers and hand lettering! Discbound Happy Planner – easy to customise! When choosing a new planner to try, it was important that it be easy to customise. I wanted to have the flexibility to add and remove pages as necessary, and to add my own printable pages. I also needed a monthly and weekly layout that had a good amount of space to write and draw on. Plus, if I was going to go down the pre-designed planner route, it needed to be a planner with an overall look and feel that I adored! The discbound Happy Planner system fit all my requirements. It’s ideal as pages can be easily added or removed from the discs. Using the custom Happy Planner punch, I’m able to turn my printable designs into Happy Planner inserts. I print the dot grid paper at home using my ink-jet printer. I print on both sides of the paper so I end up with double-sided dot grid planner inserts. Adding a dotted page right in the middle of my Happy Planner Weekly Spread allows me to write my daily log while also viewing my weekly spread. If I write a lot, I simply add an extra page of dot grid paper. But most weeks one sheet is enough. I’ve used this system of daily logging in my Happy Planner for about six weeks and it’s working really well to keep me organised and productive. Create a ‘Happy Planner Bullet Journal’ using printable dot grid paper from my free Planner Lovers Resource Library. Another way I’ve been using dot grid paper in my Happy Planner is to write a daily journal entry and create collections. I insert these pages at the beginning of each month, just in front of the monthly tab. A custom ‘monthly index’ helps me keep track of which collections are inside which month. Now that I’m capturing tasks, events, notes and ideas on my dot grid paper, I’m free to use the Happy Planner Weekly Spread in a more creative way. I use the vertical spaces to log top priority tasks, recurring tasks and appointments. I also add little drawings and memories, or highlights, from the day. This gives me the perfect opportunity to get creative and decorate my planner pages. The small vertical spaces actually minimise the decisions I need to make about how to set up a page, or where to add a drawing. It’s quick, easy and fun to fill in! I have fun adding priority tasks, highlights from my day and a little illustration to my Weekly Spread. Use Drawing Prompts to make daily drawing easy and fun! Creativity is something I really value, and I try to infuse everything I do with creativity, including my planning. Every day I share a daily drawing prompt for members of my Patreon community. I also use these prompts to inspire my own drawing and doodling every day. As someone who tends to be quite anxious, decision making is not something I’m very good at! The prompts simplify daily drawing and creativity. They make it super easy to add a quick illustration to my planner every day! I also experiment with fun, simple ways to letter creatively. I don’t worry about wobbly lines or imperfection. When it comes to drawing and hand lettering, practice makes perfect! So I figure the more practice I can get, no matter how small, the quicker my skills will improve! To help you further develop your Bullet-Journal-style Happy Planner I’ve designed some more free printable Happy Planner inserts, including Gratitude Trackers and a Weekend Log. 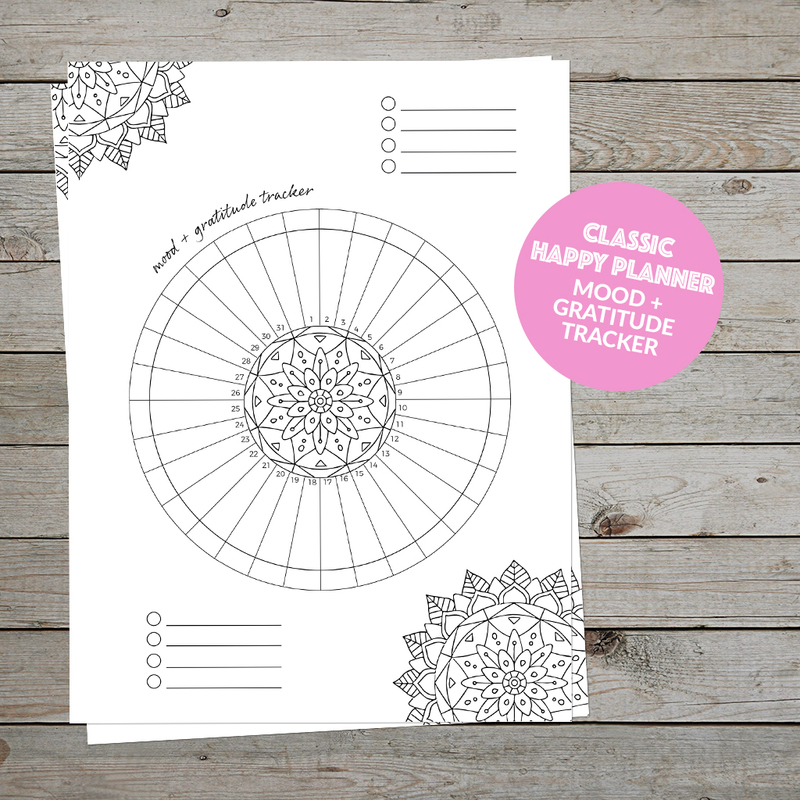 The Mood and Gratitude tracker with gorgeous mandala design can be downloaded for free from my Planner Lovers Resource Library. It allows you to track both your daily moods and gratitude practice in one place! Learn more about using the Mood and Gratitude tracker in this post. Using a Printable Gratitude Jar in your Happy Planner is a lovely way to practice self-care. 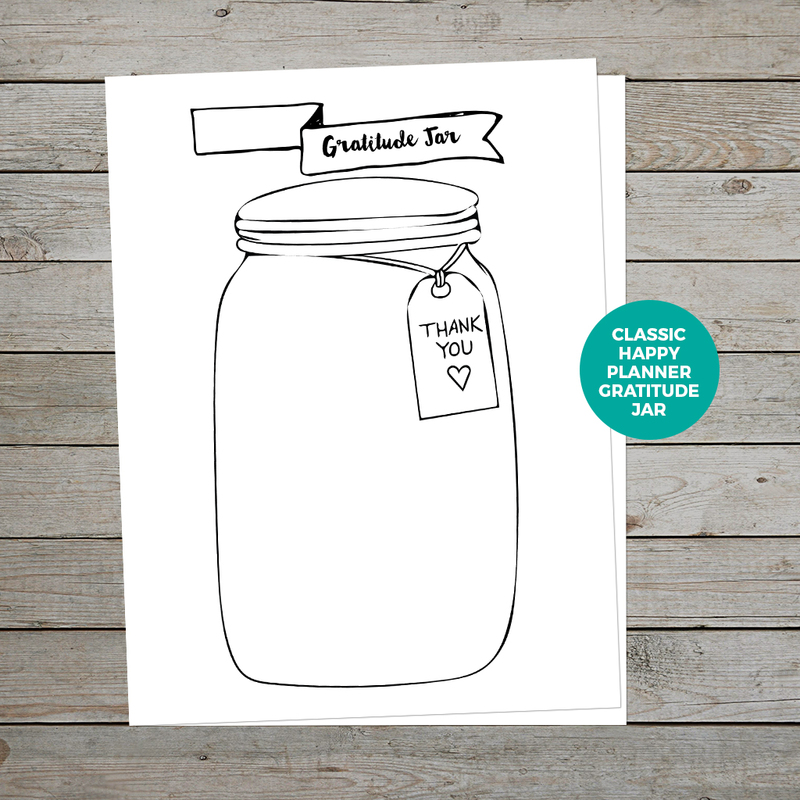 The Gratitude Jar has been one of my most popular gratitude planner printables. Now you can download it for free from the Planner Lovers Resource Library in Classic Happy Planner size! Learn more about how to use the Gratitude Jar in this post. Download a Happy Planner size Weekend Log and Passion Wheel printable from my Planner Lovers Resource Library. The printable Weekend Log is another popular page that will bring a ‘bullet-journal-feel’ to your Classic Happy Planner! Use it to explore and prioritise your passions every weekend and make more time for the things you love. You can download the printable for free from my Planner Lovers Resource Library. Learn more about using the Weekend Log and Passion Wheel in this post. If you prefer to customise your weekly log with a more ‘bullet journal style layout, download a free Watercolour Weekly Log. There’s room for your top priority tasks, weekly goals, meals, gratitude and a mini habit tracker. Find out more about using the Weekly log in this post. The best thing about creative journaling is that you have the flexibility to use any notebook or planner you love. You can truly make it yours! My advice is always to experiment, and find what works best for you. If you use a Happy Planner or bullet journal, or you’re combining both, leave a comment and let me know!